WASHINGTON — President Trump on Tuesday ousted his secretary of state, Rex W. Tillerson, extending a shake-up of his administration, 14 months into his tumultuous presidency, and potentially transforming the nation’s economic and foreign policy. Mr. Trump announced he would replace Mr. Tillerson with Mike Pompeo, the C.I.A. director and former Tea Party congressman, who forged a close relationship with the president and is viewed as being more in sync with Mr. Trump’s America First credo. It was an abrupt end — after months of speculation — to a rocky tenure for a former oil executive who never meshed with the president who hired him. Mr. Tillerson clashed repeatedly with the White House staff and broke publicly with Mr. Trump on issues ranging from the dispute between Saudi Arabia and Qatar to the American response to Russia’s cyber aggression. “We were not really thinking the same,” Mr. Trump told reporters at the White House, explaining his decision to replace Mr. Tillerson. Mr. Trump announced his decision on Twitter. At the State Department Tuesday afternoon, Mr. Tillerson said the president had called him from Air Force One just after noon — more than three hours after Mr. Trump had tweeted the news of his firing to his 49 million followers — to inform him personally of the dismissal. 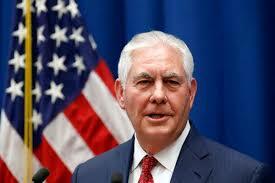 Mr. Tillerson said he planned to immediately step aside from his post, turning over all responsibilities by the end of the day to John J. Sullivan, the deputy secretary of state. “I’ll now return to private life, as a private citizen, as a proud American, proud of the opportunity I had to serve my country,” Mr. Tillerson said. He took no questions and left the briefing room. The firing of Mr. Tillerson caught even the White House staff by surprise. Just the day before, a White House spokesman berated a reporter for suggesting there was any kind of split between Mr. Tillerson and the White House because of disparate comments on Russian responsibility for a poison attack in Britain. But a senior administration official said that Mr. Trump decided to replace Mr. Tillerson now to have a new team in place before upcoming talks with Kim Jong-un, the North Korean leader he plans to meet by May. The president also wanted a new chief diplomat for various ongoing trade negotiations. The White House’s purge extended to Mr. Tillerson’s inner circle. The under secretary of state for public affairs, Steve Goldstein, was fired, and the status was unclear of Mr. Tillerson’s chief of staff, Margaret Peterlin, and his deputy chief of staff, Christine Ciccone. Mr. Tillerson was at the State Department on Tuesday and spoke to reporters, saying that he would surrender his authority at midnight and resign officially at the end of the month. At the C.I.A., Mr. Pompeo will be replaced by the current deputy director, Gina Haspel, who will be the first woman to head the spy agency. Both she and Mr. Pompeo would need confirmation by the Senate to take the positions. Mr. Tillerson has been out of favor with Mr. Trump for months but had resisted being pushed out. His distance from Mr. Trump’s inner circle was clear last week when the president accepted an invitation to meet with Mr. Kim, to Mr. Tillerson’s surprise. In a Twitter post, Representative Nancy Pelosi of California, the House Democratic leader, warned that the turnover at the top of the State Department had diminished the United States with foreign leaders. Mr. Pompeo, a former congressman, has become a favorite of Mr. Trump’s, impressing the president with his engaging approach during morning intelligence briefings. But he also, at times, has been at odds with the president — including agreeing with a C.I.A. assessment about Russia’s interference in the 2016 elections. In picking Ms. Haspel to succeed Mr. Pompeo at the C.I.A., Mr. Trump opted for continuity rather than bringing in an outsider. At one point last fall, Senator Tom Cotton of Arkansas, one of the president’s closest Republican allies on Capitol Hill, had been tentatively tapped as the front-runner to run the agency if Mr. Pompeo moved up, but the idea later faded. Mr. Tillerson, a former chief executive of the oil giant Exxon Mobil, had once been viewed as an intriguing, if unorthodox, cabinet choice. He had deep experience with Middle Eastern potentates, and knew President Vladimir V. Putin of Russia through Exxon’s extensive efforts to explore for oil in Russia. But the early enthusiasm for bringing a business sensibility to the State Department faded fast, as Mr. Tillerson seemed overwhelmed by the diplomatic challenges before him and isolated by career foreign service officers whom he often froze out of the most important debates. His profound disagreements with the president on policy appeared to be his undoing: Mr. Tillerson wanted to remain part of the Paris climate accord; Mr. Trump decided to leave it. Mr. Tillerson supported the continuation of the Iran nuclear deal; Mr. Trump loathed the deal as “an embarrassment to the United States.” And Mr. Tillerson believed in dialogue to resolve the North Korean nuclear crisis, but Mr. Trump repeatedly threatened military options. Veteran diplomats said they could not remember a time when a president so regularly undermined his secretary of state so brazenly in the midst of a tense situation. Richard N. Haass, the president of the Council on Foreign Relations, who served many Republican presidents, last fall urged Mr. Tillerson to quit. Career diplomats, who had seen in the gravelly voiced Mr. Tillerson a man of stature, experience and great wealth whom they hoped the president would respect and heed, eventually turned against him as he expressed more interest in shrinking the department than expanding American influence. While other cabinet officers made their goals plain, Mr. Tillerson never set clear diplomatic priorities other than to pursue Mr. Trump’s slogan of “America First,” a term he never really defined. In an odd admission more than eight months into the job, Mr. Tillerson told employees in September that his top priority was to make the State Department more efficient. Yet he never fully addressed what diplomats should be doing with that greater efficiency. Congress rebelled, declining to endorse his suggested 30 percent cuts in the State Department’s budget. But the message of his tenure seemed clear: At a moment when money was being poured into the Pentagon and intelligence agencies, diplomacy seemed less valued than at any time in recent American history. The turning point for Mr. Tillerson came when NBC News reported that he had called the president a “moron,” leading him to take the extraordinary step of holding a news conference to affirm his support for Mr. Trump and insist that he had never considered resigning. “Save your energy Rex,” he added, “we’ll do what has to be done!” Mr. Trump later said he wished his secretary of state were tougher. The Chinese were left to wonder why Mr. Trump sent an emissary whose message the president did not believe in. Mr. Tillerson had some successes, including the growing international isolation of North Korea and improved ties between Saudi Arabia and Iraq. But he is likely to go down as among the least successful secretaries of state in history, and one big reason was his poor management of his relationship with Mr. Trump. Although Mr. Tillerson spent his first months on the job getting to know Mr. Trump at lunches, dinners and White House get-togethers, the two never established a comfortable rapport. Once the head of the Boy Scouts of America, Mr. Tillerson was outraged when the president spoke to the Boy Scouts in July and turned it into a political event. When Mr. Trump declined to denounce white nationalists who paraded in Charlottesville in August, Mr. Tillerson made it clear that Mr. Trump “speaks for himself” — not his secretary of state. The growing distance between the men was on clear display during Mr. Trump’s trip to Asia in November, when Mr. Tillerson visited the prison that once housed Senator John McCain, a Republican from Arizona who is a frequent critic of the president. But perhaps the most puzzling part of Mr. Tillerson’s tenure was his poor oversight of the State Department. As a former top business executive, his managerial skills were thought to be his chief asset. But he failed to quickly pick a trusted team of leaders, left many critical departments without direction and all but paralyzed crucial decision making in the department. He approved one global conclave in Washington just eight days before the event was to start, ensuring that few leaders from around the world were able to attend. He rarely sat for comprehensive briefings with many of his top diplomats and often failed to consult the State Department’s experts on countries before visiting. Foreign diplomats — starting with the British and the French — said Mr. Tillerson neither returned phone calls nor, with much advance warning, set up meetings with his counterparts. Strategic dialogues with many nations, including nuclear weapons powers like Pakistan, were ended without explanation. The State Department’s policymaking process devolved into conversations between Mr. Tillerson and a lone top aide, neither of whom had much experience or knowledge about many of the countries they discussed. Mr. Tillerson became so isolated that even top administration officials like Mr. Pompeo and allies like Condoleezza Rice, the former secretary of state whose recommendation was crucial to his selection, had trouble penetrating a phalanx of staff to speak to him directly. 0 Response to "Trump Fires Rex Tillerson and Will Replace Him With C.I.A. Chief Pompeo"